After considerable internal debate and discussion with many of those who make up the Top Digger list, weâ€™ve decided to remove the list beginning tomorrow. As for whatâ€™s next, weâ€™re currently working on designing and refining the technologies required that will help enable our nearly 900,000 registered users to make real connections that we believe will greatly enhance the Digg experience â€“ whether youâ€™re brand new to the site or have been on Digg since the beginning. I can appreciate the challenge that Kevin and the folks at Digg have in fighting gaming of the system — but this is a fairly radical step — interestingly, the initial reaction on Digg is decidedly mixed, pro and con, but it won’t shake out completely until diggers have absorbed the reality of the vanished list. The fascinating question for me is whether Digg can succeed at surpressing or at least hiding the natural tendency of a handful of users to drive the lion’s share of value in an open participation community — is it possible to “engineer” community and participation dynamics without destroying the community and killing off participation? Live by community, die by community. How delicious is this irony? 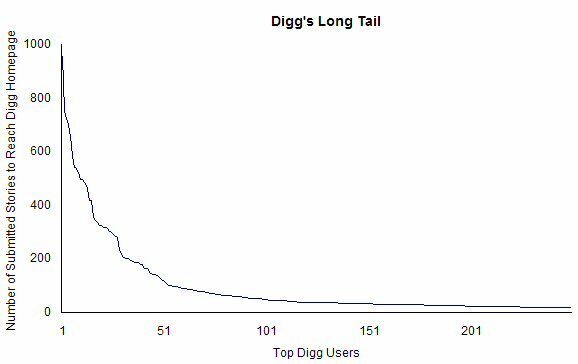 The top digger list is back, reproduced by a Netscape employee. The rankings are apparently being scraped from individual user profiles, where the ranking is still displayed. It will be interesting to see if Digg puts a stop to this scraping by removing these rankings from individual pages, stripping top users of another symbol of their accomplishments. People may not require monetary compensation for their hard work, but they do require some recompense. There are still rewards to using the Digg system — links to individual user profiles are still listed on stories that are dugg, users still have their lists of friends and the history of their activity in the system, etc. But if top users don’t feel properly rewarded for all of their hard work, and therefore stop working so hard, will the rest of the community step in to pick up the slack? It’s a fascinating experiment to watch.